Trees line the grass lot near Dave Diles Park in Middleport. The trees are decorated in various themes and colors by local businesses, organizations and individuals. Decorations for this tree were made by local elementary students. 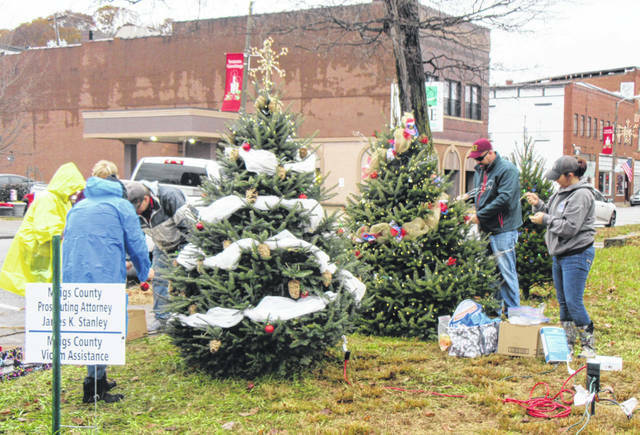 Numerous individuals braved the rain to put up the trees last weekend. 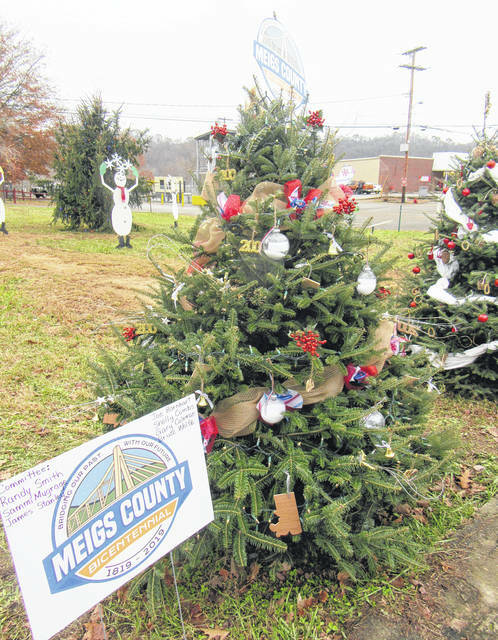 The tree decorated by the Meigs Bicentennial Committee represents 200 years of Meigs County and includes ornaments for each of the townships. 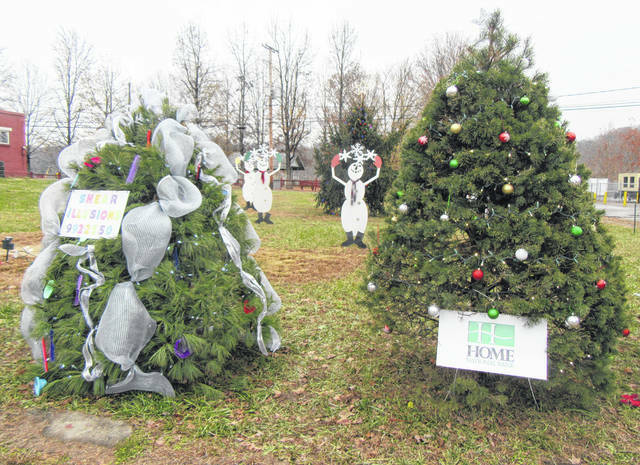 Middleport businesses Shear Illusions and Home National Bank have trees decorated in the display. 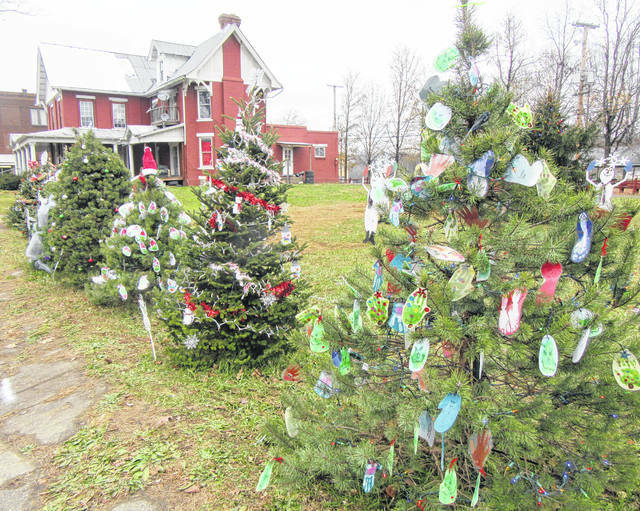 MIDDLEPORT — Two hundred years of Meigs County, the art of young students and more are on display as part of the first tree display in the village of Middleport. 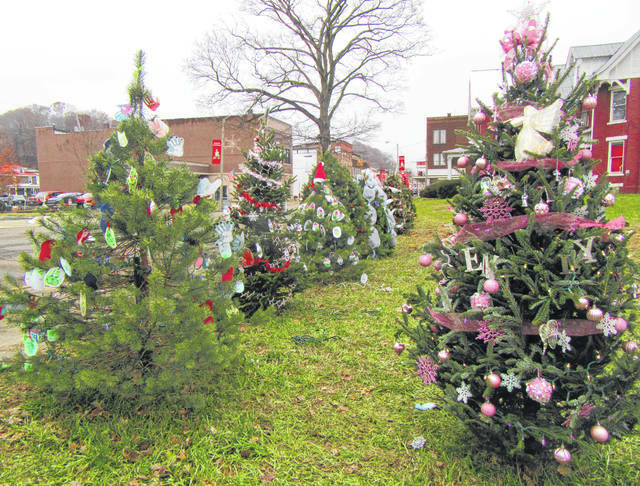 Near the “T” in Middleport, where there was an empty grass lot a few weeks ago, there are now several decorated Christmas trees, the work of businesses, individuals and organizations. The idea for the tree display came about a few weeks ago with village officials, including Administrator Joe Woodall and the Recreation Committee, working to bring the idea to life. 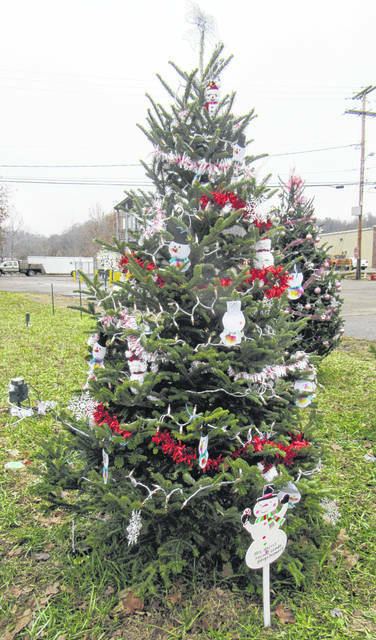 Mayor Sandy Iannarelli explained that the idea was being modeled after what Gallipolis has done for the past several years with the trees at Gallipolis in Lights, although on a smaller scale. 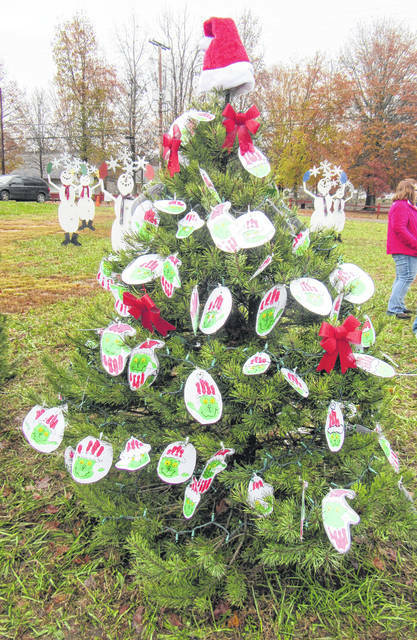 Among the trees is one decorated with cutouts of Meigs County and “200”, along with ornaments listing each of the counties townships in honor of the upcoming bicentennial in 2019. Other trees are decorated with painted hand prints from local elementary school students, as well as ornaments they created. Home National Bank, Shear Illusions and the Middleport First Baptist Church Youth have trees in the displays, along with a tree decorated in memory of Emily Grace Deem. The trees will remain on display until the first of the year, with spaces still available for those who are interested in taking part. Those interested in placing a tree should contact the village water office, 740-992-5571.